Airports Authority of India released AAI Junior Executive Recruitment 2018-2019 Notification. And this advertisement is for 542 Junior Executive Vacancies. Therefore, those people who want to Work with AAI can check this new notification and carry on to apply for the AAI Openings 2018-2019. Apparently, the officials of the AAI are looking for the people with certain qualifications that will fit for the available vacancies. So, proceed and check them all to get an overall idea about the Requirements. Accordingly, the Airports Authority of India is expecting the eligible and interested contenders, to apply for the available positions by 27th April 2018. And they even mentioned that they are going to accept the application from 28th March 2018. AAI said that they are not going to accept the applications if they are submitted after the closing date. Though there is some time to apply, better to check the information beforehand. Tired of searching for AAI Junior Executive Recruitment 2018-2019? Well, you have ended in the correct place. 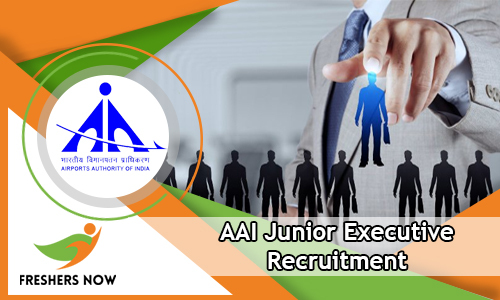 We are writing this new post for the sake of the people who are looking ways to know about the complete information regarding AAI Junior Executive Vacancies 2018-2019. Now, this post contains main details such as the name of the Organization along with the Number of Vacancies, Name of the Vacant positions. Apart from these people can also find about the Educational Qualification, Age limit, Age relaxation, Selection Process, Application Fee and Salary information and all. And along with all these details, for the convenience of people, we are also providing the direct link to download and check the AAI Junior Executive Recruitment 2018-2019 Notification. The willing contenders can also find some simple steps at the bottom of this post. These Steps will help the candidates, to apply. Please proceed and find out the uttermost important details from the above table. It consists of all the information, you are looking for. And even we took enough care to include all the necessary details. By checking this post, you will get an outline. Apart from this, it will be easy for you to understand other requirements. Now, according to the data in the official AAI Junior Executive Recruitment 2018-2019 Notification, all the people must and should have the correct qualification at the time of applying. Remember that nearly having the qualifications will not guarantee you to the Next rounds, keep that in mind. Now, as per the information in the AAI Junior Executive Recruitment 2018-2019 Notification, all the people need to have stated educational Qualification in the advertisement. Find out the relevant information by going through the next sections of this post. Bachelor’s Degree in Engineering/ Technology with minimum 60% from a recognized institute or University in India is the required educational Qualification. Remember all the people need to have it while applying. If not the officials are going to reject the Application Form. And next important thing all the applicants need to know about is Age limit. Having correct age is quite important. Now, as per the information in the official AAI Junior Executive Recruitment 2018-2019 Notification, the minimum age can be 27 years. While the Maximum Age can be 32 years. And the officials of Airports Authority of India also mentions that there is some age relaxation. Therefore, to get the details about age relaxation, the applicants need to check the Advertisement. For the sake of the people, we gave the link to the AAI Junior Executive Recruitment 2018-2019 Notification. Click on the link and download it. Now, next important factor that will affect the consideration of application form is the application fee. Well, all the contenders need to pay the application Fee, that is mentioned in the AAI Junior Executive Recruitment 2018-2019 Notification. Basing on the information given in the official AAI Junior Executive Recruitment 2018-2019 Notification, all the people belonging to the General Category should Pay Rs.300/- as the Application Fee. While the SC/ST and PWD contenders are exempted from pay the Application Fee. Therefore, kindly take some time and check the advertisement before paying the application fee. As many of the sites are misleading the people with fake information. Try to find out more other details by checking next sections of this post. So, after paying the application fee and submitting the Application form before the final date the people need to know about next process. Now, as per the information in the official AAI Junior Executive Recruitment 2018-2019 Notification, all the people in the next rounds have to face Recruitment rounds. Now, basing on the hiring process, the officials are going to select the applicants. Therefore, all the candidates should be aware of the Selection Process. According to the AAI Junior Executive Recruitment 2018-2019 Notification, GATE 2018 score is taken into consideration. And based on that GATE Score, the applicants are finalized for the next rounds. The Officials of Airports Authority of India mentions that the selected candidates will now directly go to the Document Verification. Apart from these two, there are no other rounds, that the officials are going to conduct in order to choose the best applicants. Therefore, candidates who are having all the qualifications can now apply for this AAI Junior Executive Recruitment 2018-2019. Next important thing is Salary. Well the officials of AAI are going to pay a good salary for selected people. As per the information in AAI Junior Executive Recruitment 2018-2019 Notification, Rs.40,000 to Rs.1,40,000 is the monthly salary. Remember you need to have all the qualifications correctly. Bachelor’s Degree in Engineering/ Technology with minimum 60% from a recognized institute or University in India is the required educational Qualification. So, selected people will get Rs.40,000 to Rs.1,40,000/- Per Month. So, go to the official site of Airports Authority of India at www.aai.aero. And go to the Careers sections. Like all the information is given about AAI Junior Executive Recruitment 2018-2019 Notification on this page? for more such updated information and data, check our site Freshersnow.com.